The 4-man scramble is a popular format for golf tournaments. The scramble format often is used at large-scale golf events, such as charity, corporate or pro-am outings. A prime advantage of a scramble is it allows players of all abilities to contribute to the team's success and helps speed play. Golfers who are new to the format can quickly learn the rules and terminology. The most common scramble format is for four players, but it can be used with fewer or more players. 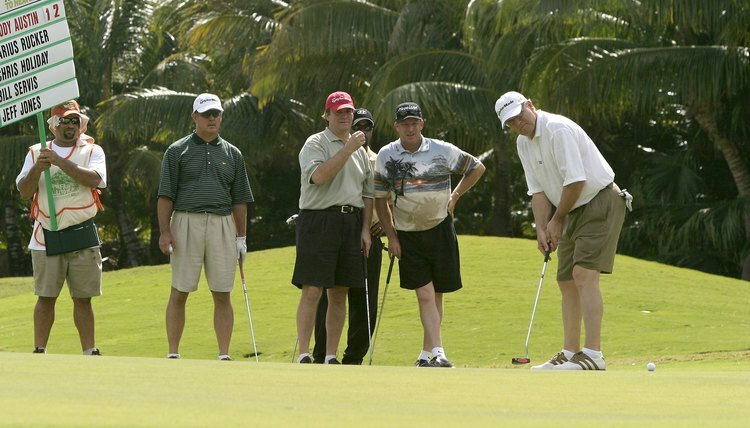 The four-man scramble features teams of four players competing against one another. In this format, each team's players hit from the teebox, then the team members choose the best of the four shots for the next shot. All team members then play the second shot from that location, and again choose the best shot. Play continues in this manner until the hole is completed. The team then records its score and maintains that format for all 18 holes. There is one primary difference between 2-man and 4-man scrambles. In most 2-man scramble tournaments, the players' handicaps are taken into account when tabulating scores. In 4-man scrambles, due to the number of players on each team, handicaps typically aren't used. Scramble tournaments often are used at charity and fundraising events, many of which feature novice or occasional golfers. Many of these golfers have a high handicap. By forming teams in groups of four, it increases the odds that at least one player on the team will hit a quality shot during every rotation, thus helping speed the pace of play. The format also plays to certain golfers' strengths. For example, some golfers excel at hitting tee shots, while others are better at chipping and putting. A 4-man scramble gives each player a chance to shine on various shots on any given hole. Variations of the standard 4-man scramble can be implemented to make the game more interesting or challenging. One way to challenge team members is to require a minimum of two tee shots to count for each player during a round, which puts pressure on players to produce at least two quality drives. Another variation is to not allow any player's shot to be used twice in a row. This eliminates a team's ability to rely solely on one standout player. Scramble tournaments are common at many golf courses. Some public courses offer weekly scrambles, in which a player pays a fee to participate as part of an organized team or can be matched with random teammates. Many corporations and charities also offer scrambles that are open to the public. A good way to find scrambles is to check with local golf courses.